After almost six years BAE Systems, one of the first companies to join the UKVI model portfolio, has been sold. In the rest of this post I’ll cover why I bought it, what happened during its time in the model portfolio and why I’ve decided to sell. As one of the world’s largest defence companies, BAE Systems joined the model portfolio in 2011 because it was – and is – exactly the sort of large, successful and relatively defensive company I’m always looking to invest in. However, as a value investor I’m also looking to invest when investor sentiment and therefore prices are low, and in 2011 BAE was facing serious headwinds in the form of reduced government budgets as a result of the financial crisis. In the UK and US in particular (major markets for BAE), defence programs were either being cut, being reviewed in order to decide what to cut, or almost certain to be cut in the near future. In addition, investors were worried about US and EU governments defaulting on their debts, which could have triggered another financial crisis. With all this negativity in the air the FTSE 100 stood at 5700, much lower than it is today, and briefly fell as low as 5000. At the time I thought these headwinds would turn out to be temporary. I thought that when they died down, BAE’s share price would return to more normal levels, and as the chart below shows, that’s exactly what happened. The first thing I look for in a company is a long and consistent record of dividend payments. In addition, the dividend should preferably have been growing whilst being supported by relatively steady earnings and revenue growth as well. Although the company’s earnings are perhaps surprisingly volatile, the overall picture is one of rapid and reasonably steady growth, which continued right through the financial crisis. 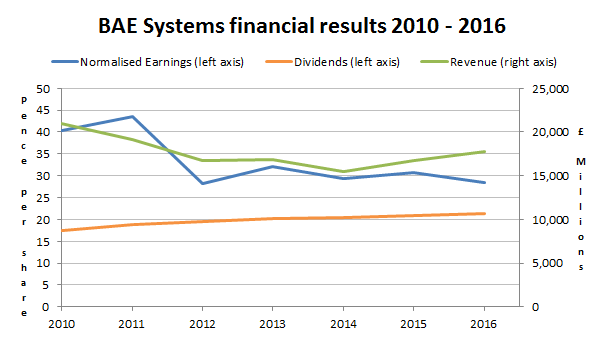 Relative to the FTSE 100 average, BAE’s track record over the previous decade had been impressive. As a general rule, the stock market does not offer up companies with double digit growth rates and 6% dividend yields without good reason. In BAE’s case, there were significant and self-induced internal risks to go along with those external budget cut risks. One major risk was BAE’s massive defined benefit pension scheme. In the 2010 annual report the company’s pension liabilities were more than £21 billion with a pension deficit of £3.1 billion. Those are huge liabilities, dwarfing BAE’s then-recent average profits of £1.2 billion. In order to reduce the deficit, BAE had agreed to pay several hundred million pounds into the scheme each year. That’s a lot of money and is about as much as the company was paying in interest on its £3 billion debt pile. On their own, those debts of £3 billion gave BAE a debt to profit ratio (the debt ratio) of 2.6, which I think is relatively prudent. But viewing the pension deficit as a debt, which is entirely reasonable, increases BAE’s 2010 debt pile to £6.2 billion. That’s 5.3-times the company’s average profits of £1.2 billion, which is above the maximum multiple that I would allow today. However, in 2011 pension liabilities were not on my radar and so I did not factor them into my analysis of BAE’s debts. As a result I did buy BAE and, as luck would have it, its pension deficit and the related cash payments have so far failed to cause any serious problems. The picture was similar in the UK, as the Strategic Defence and Security Review looked to cut the UK defence budget back to sustainable levels. For 2011 sales were expected to decline, although the directors were brave enough (or mad enough) to raise the dividend by almost 10%. Since most investors hate negativity and uncertainty, this negative environment led BAE’s share price down to around 250p on a couple of brief occasions, giving the shares a mouthwatering but short-lived dividend yield of 7.5%. Focusing on electronics, cybersecurity and intelligence, three markets which were expected to grow. The board showed their continued confidence (or their reluctance to accept reality) by raising the dividend again. 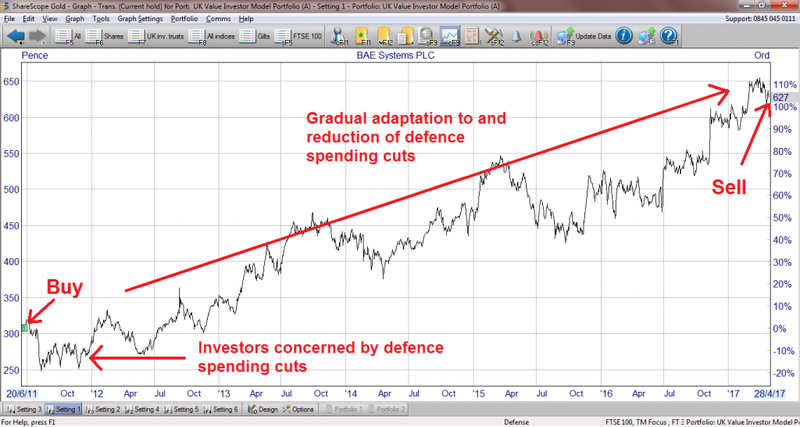 Despite the board’s confidence it gradually became clear that investors were probably right to be wary of BAE back in 2011. Year after year, government cuts continued to squeeze defence budgets and year after year BAE saw its revenues and earnings decline. However, the tone of the annual reports eventually became less negative. Overall I would say that BAE’s story is fairly typical for a defensive value investment. We have a fundamentally sound business which was trading at an attractive price because it was facing some obvious external problems. Rather than simply taking the impending hit on the chin, the company adapted its strategy in order to reduce the impact and stay on its feet. After several years of underperformance, the external problems began to fade and the company’s underlying strengths and adapted strategy allowed it to aim for growth once again. So if BAE is such a good company and if its medium-term prospects are now better than they have been at any time since it joined the model portfolio in 2011, why am I selling? The answer is twofold. First, and as with most successful value investments, price is the most important factor. 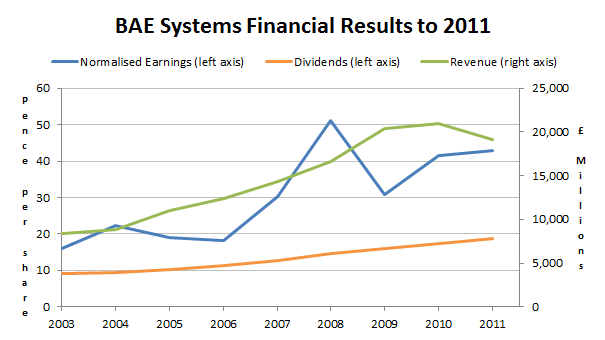 BAE’s share price has doubled since 2011 and as a result its valuation ratios have become far less attractive. This can be seen most clearly in its dividend yield, which has fallen from 6.1% at purchase to 3.3% today. A dividend yield of 3.3% is not bad, but it isn’t anything to get excited about either, especially when the dividend has only been growing at two or three percent in recent years. At the same time, BAE’s excellent track record of growth has turned into an uninspiring track record of stagnation. This combination of higher valuation ratios and lower growth have driven BAE far down the UKVI stock screen. In fact it is currently the lowest ranked holding in the model portfolio and ranks just two places higher than the FTSE 100. If I want the model portfolio to beat the market then it needs to be filled with stocks that are faster growing and more attractively valued than the market, and BAE no longer fits that description, as the table below shows. Second, BAE’s pension scheme is still a serious risk and despite ploughing hundreds of millions of pounds into the scheme to reduce the deficit, the pension scheme and its deficit are today larger than they have ever been. The pension scheme has gone from £21 billion in 2010 to £29 billion today, while the deficit has ballooned from £3.1 billion to £6.1 billion. Add that deficit to the company’s borrowings and you have “debts” of more than £10 billion today, which is about ten-times the companies recent average profits. That’s way more than the five-times maximum I would prefer. As a result of these various factors, I have removed BAE Systems from the model portfolio and my personal portfolio. The proceeds will, as usual, be reinvested into a new holding next month. Good move, did the same last year. John – I guess there are quite a few others to add to that list, GKN springs to mind, although the CEO recently came out in defence of the pension stating that the market was responding overly negatively to the overall pension risks — I suppose he would say that wouldn’t he? A new stock or a combination of additions to existing? LR — and this time next year we’ll be………… Rodney! There definitely are many others and to some extent they’re victims of the way pension liabilities are calculated. As far as I’m aware the liabilities are calculated using bond yields as the basis for the discount rate, so the current historically low yields means higher pension liabilities. However, if the pension liabilities are 10 to 20-times what the company earns, or if the deficit is several times what the company earns, then there’s a problem regardless of the discount rate. As for reinvesting the cash from BAE, it will go into a single new holding. For the model portfolio I have a simple one-in-one-out policy and never top up existing holdings. This makes it much easier to track performance. My personal portfolio is pretty much the same, although less strict (e.g. if I have too much spare cash then some of it will go into existing holdings). On the issue of pension deficit and assuming that Brexit will cause the UK to go into another recession. Then do you think that if the BOE cut interest rate to negative, would that explode the pension deficit? Thanks walter, although my lucky stars have a lot to do with it. Negative interest rates are definitely bad for pensions, but we don’t need to see the BoE introduce negative rates, we just need to see negative government bond yields. In fact we’ve already had that in several countries, including Germany, and the impact was indeed not good for pension funds. I think an extended period of negative BoE or bond rates would probably send BAE and its pension trustees back to the negotiating table to see what could be done. There could be a reduction in payouts to pensioners for example, and of course the company would have to fork out yet more cash to reduce the ballooning deficit. Either way it would not be good. Here’s a long but interesting article on negative rates in Germany. Sold BAE as well last year when needed funds to increase my holding in Boeing, which I sold recently too at a chunky profit. All defense companies seem to sell now at a high premium, so apart of a small holding of 1.5% holding in Rathyeon I sold along the line. Bought in February and sold in May Rolls Royce too, don’t think it is worth more than 900. There are little fishing grounds left in the UK, but Europe is trowing bargains, companies with 20% ROE at less than 20 times P/E ratio and low dividend payout (which I like). On the UK, I disagree. I think UK cyclical stocks are cheap because of fears over Brexit. A certain Mr Woodford has recently started loading up on them too. Having said that, I’m sure Europe also has its fair share of bargains thanks to its many economic problems. Thanks for the article and your thoughts on the issue John.